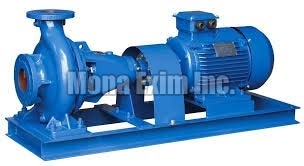 We are one of the renowned Manufacturers, Exporters and Suppliers of precision-engineered Horizontal Centrifugal Pumps. Our Horizontal Centrifugal Pumps are manufactured in compliance with international standards as. Our Horizontal Centrifugal Pumps are designed to endure high pressure and high discharge application. In addition, they have several in-built design and constructional features that ensure high efficiency without much electricity intake.